From the original ICEHOTEL® in Swedish Lapland to the smaller more intimate winter villages and snowhotels that have been artfully crafted across Finland, Norway and Sweden, there are some unforgettable ice and snow accommodation options available across Lapland which offers unique overnight experiences for families. Essentially ice and snow hotels are exactly as described – a place to spend the night that has been completely crafted from ice, snow and ‘snice’ (a combination of the two). Whilst some of these awesome buildings originally started as a simple igloo for guests to sleep in, interest in them has led to them becoming incredibly beautiful and intricate works of art, filled with sculptures, ice art and lovingly crafted ice furniture. For families with older children (we would not recommend them for children younger than 12), they offer a very special overnight experience to add on to their adventure in Lapland. There’s something particularly cool too about the fact that the room you are staying in is something which is unique to that season – each year, as summer comes ice and snow hotels are left to simply melt back down into the ground. For those with younger children we do offer tours where possible, as people of all ages find these structures amazing places to visit. Where can we find an Icehotel or Winter Village? For those who want to experience the original ICEHOTEL®, you can find it in Jukkasjärvi Sweden, it can be added on to our Brändön Lodge - Pick and Mix Holiday. Families will be amazed at the intricate details of the snow and ice sculptures and the themed suites that in the past have featured ice carvings of dancing polar bears and chess pieces (the themes change each season and you are sure to see something special). 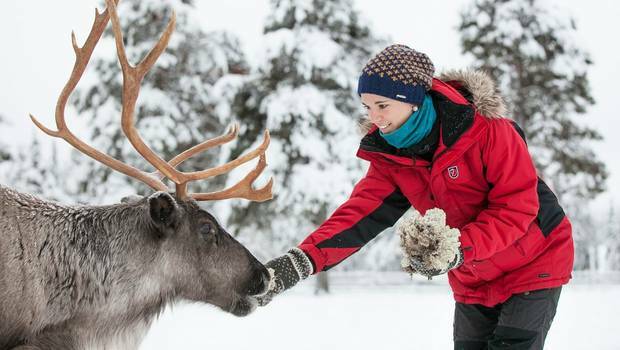 We also have destinations which feature ice and snow hotel on a smaller scale such as Torassieppi Winter Village which features on our trips to Jeris, Harriniva as well as Torassieppi Reindeer Farm. This consists of ten snow rooms and provides a smaller scale, but none the less unforgettable experience. In Norway you can spend the night in Sorrisniva Igloo Hotel in Alta or Kirkenes Snowhotel. These are two of our most favourite ice and snow hotel experiences with each featuring beautifully artistic sculptures. If you’re not sure which experience would suit your family best, do feel free to have a chat with our Travel Experts – most of them have spent at least one night in a snow room and they have toured almost all of them. Whilst the rooms are usually entirely crafted of ice and snow, the beds will be topped with a thin mattress and cosy reindeer skins so you will have a comfortable base to sleep on. At each location you will also be equipped with an arctic grade sleeping bag so you don’t need to be polar explorer in order to survive. You can expect temperature to remain at around -5°C, regardless of the temperatures outside and you will be well equipped for such temperatures. Obviously these conditions are not for everyone and so we feel that children under 12 should simply enjoy a visit to explore rather than an overnight stay. We would advise families to always heed the staff’s advice about what to wear to bed (i.e. not as much as you would think!) and take on board some of their top tips, such as tucking your jumper in the bottom of your sleeping bag so it’s nice and toasty in the morning! Most people find that they get an exceptional night’s sleep however, as the snow absorbs almost all sound so they are very peaceful places to stay. Rooms tend to be doubles (with the occasional triple available) so please be aware that children may need to be in their own room and they should be comfortable with this. Some of the hotels do offer warm rooms or lounge areas that guests can head to if they decide that the cold is too much but they are not hugely well equipped. The age restrictions at each of the ice and snow hotels can vary so please speak to our Travel Experts for specific details. They will be happy to provide you with answers to any questions you may have.